Heat oven to 375 degrees. Stir together the flour, soda and salt; set aside. Beat butter with brown sugar and granulated sugar at medium speed until creamy. Add vanilla extract and egg mixing on low speed until blended. Gradually blend the dry ingredients into the creamed mixture. Stir in 1 cup chocolate chips. Drop by generous tablespoons onto ungreased baking sheets (yielding 24 cookies). Bake 9 to 11 minutes or until golden brown. Cool a few minutes on the baking sheet before transferring to racks to cool completely. 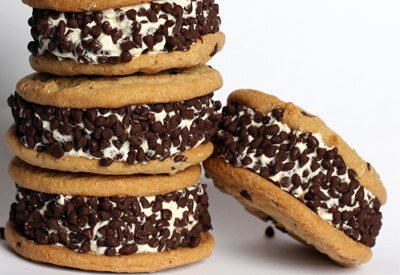 Working quickly and in small batches, make a sandwich by placing a small scoop of ice cream onto the flat side of one cookie. Top with a second cookie and press lightly. Roll sides of cookie in miniature chocolate chips. Press chips lightly into ice cream. Place sandwiches on a baking sheet and into the freezer and freeze until hard, at least 2 hours. The sandwiches can then be wrapped individually using aluminum foil or plastic wrap and then placed in zipper storage bags. Remove from freezer a few minutes before serving.